Michael Hamberger of the Washington, DC area contacted me a while back to bring to my attention an article he had co-authored on the subject of psychological momentum (PM); he was also kind enough to send me a copy, for which I thank him. Mike Hamberger came to Sidwell Friends in 2004. He was a decathlete at Widener University his junior and senior years. He completed his master's degree in Kinesiology with a concentration in Sports Psychology at the University of Maryland. Hamberger, M., & Iso-Ahola, S.E. (2004). Psychological momentum and athletic performance: A critical review of research. Journal of Contemporary Athletics, 1, 207-226 [link to journal]. 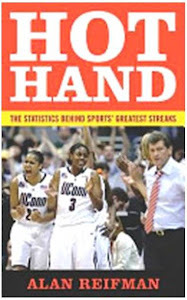 Most of my reading on hot-hand issues over the years has been from psychology and statistics journals, to the relative neglect of the exercise and sports science field. The review article sent to me by Hamberger is thus a nice "helper" in catching me up on the latter literature. The article uses as a running theme the statistic of the form, When Team X scores first, it wins Y percent of the time, with Y usually being a number well above 50%. I know that I cringe every time I hear such a statistic during a game broadcast. There are at least two problems with this type of assertion. First, especially in low-scoring sports such as soccer, hockey, and baseball, the same event -- scoring a goal/run/point -- contributes to both variables being correlated, which team scores first and which team wins the game. ...rather than attribute victory to psychological momentum gained from early success, one should consider that "athletically superior teams tend to get ahead [early] and stay there"...(p. 215). What about when two opponents are equal in skill? Evidence seems ambiguous as some studies support the PM effect... while others do not. This controversy may be due to three factors. First, some sports (e.g., tennis and racquetball) are more conducive to PM than other sports (e.g., baseball and basketball)... Second, there are methodological problems and questions about previous studies and statistical analyses reported in them... Third, PM effects may vary as a function of individual differences and duration of time. That is, certain individuals are more likely affected by PM, and PM effects may exist but may be short-lived and thus cannot be captured by crude statistical analyses (p. 221). Given that the article appears in a relatively new journal, it may not be widely available in libraries. I would still recommend the article, if you can get your hands on it.